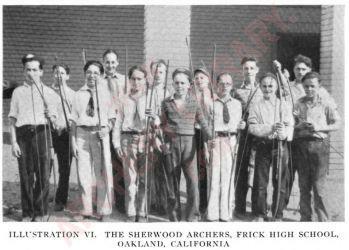 Bows and Arrows for Boys, George C. Decker, 1930.—Summary of modern archery. Modern archery had its beginning in 1844, when a general meeting of bowmen was held at York, England. The following summer, a grand national meeting was held, the first of a yearly championship series which has continued up to the present. Antedating this event, however, the first archery club was formed in the United States in Philadelphia, in 1828. This society, the United Bowmen, continued in existence until 1859. The National Archery Association was formed in 1879 at Crawfordsville, Indiana, but the archery craze faded, though the organization continued and is still in existence. A few individuals kept the game alive from that day to this, when the present interest in all sports has brought archery into a new heyday. Note should be taken here of some of the champions of archery. L. M. Maxson, one of the original Potomac archers, held the record for ten years for a long-flight shot. His distance was 290 yards. In 1925, Prof. C. D. Curtis, of North Dakota, shot an arrow 304 yards. He used both his arms and legs to make this record, lying on his back and pressing the bow outward with his feet. In March, 1928, Howard Hill, a professional archer of Opa Locka, Florida, broke all long-flight records with a shot of 396 yards. Among the record scorers was Horace A. Ford, who, at the Four­teenth Grand National Archery Meeting on July 1 and 2, 1857, at York, made 1251 points for the Double York Round. That record was un­broken until November 17 and 18, 1928, when Clinton W. Douglas, of Los Angeles, turned in a score, for the Double York Round, of 1309. Still, one turns again to Robin Hood for tales of marvelous shoot­ing. Robin, the peer of all, was wont to test the marksmanship of his recruits by placing a peeled willow wand, "rather thicker than a man's thumb," at a distance of 75 or 100 yards, declaring, "He that hits that rod, I call him an archer fit to bear both the bow and quiver before a king." Some of his men were reputed to wield bows with a pull of from 100 to 125 pounds. Today, the average archer uses a bow with a pull of only 50 to 75 pounds. The strongest archer in this country, Howard Hill, employs one with a pull of 150 pounds. As a monument to the prowess of the ancient English archer, there is an arrowhead buried 4½ inches in an oak door in the Tower of London. It is said to have been fired at an escaping prisoner. Modern arrows, however, wide-bladed and sharp as a razor, will cleave through a sixteenth of an inch or more of steel at 20 yards. So powerful is the bow as a weapon, that modern hunters have brought down deer, mountain lions, and even grizzly bears—the largest and most danger­ous of animals on this continent—with it.